This article was originally published on Medium by Akilah S. Richards. It is reposted here with the permission of the author. "Traveling turned out to be a big part of our deschooling process as a family. When public education showed us, for the umpteenth time, that it was not designed to nurture children into confident adulthood and emotionally sustainable life skills, we made our way to unschooling. Like many unschoolers, we stopped at homeschooling along the way, struggling to fully understand the mental shift from structures and coercion to trusting children and valuing natural learning. Eventually, we figured out a way to get a change of scenery; we’d move to a place with a lower cost of living, an easier, slower energy, and the benefits of rich cultural soil. We decided to spend time as adults and parents in the place we spent our childhoods. Moving to Jamaica and spending five months on a new-to-us part of the island with Marley and Sage, of course, came with its share of maybe this won’t work out moments. Everything from renting a car with no credit card, hefty deposits that tie up our cash, finding safe neighborhoods in our fluctuating budget, and battling tourist prices in markets and roadside shops made our school-free, location-independent lifestyle a tough path to pave. These issues still arise from time to time. Still, at no other time in my life have I experienced as much of a positive, relationship-strengthening, spiritual, physical, and emotional shift than I have since we embraced unschooling and became digital nomads. We let go of a lot things — furniture, cars, clothes, literal baggage — because our new lifestyle called for the ability to pivot and to remain flexible over the right sized house in the right neighborhood, bowing to mortgage gods and student loan masters. Marley and Sage, by demanding to be free from schoolishness, freed us from the lives we’d marched lock-step into with the rest of the people around us. School, job, kids, kids and school, more expenses, more working, less time together, raise children, repeat cycle with nicer stuff. When our daughters disrupted that and our lives stopped revolving around school, we looked up and saw our option for living together, traveling to experience more of the world, and having less physical things attached to ourselves. Storage units here, boxes of things in parents’ closets there, it started to feel like a sickness we had to literally unpack, one box and bag at a time. Unschooling was our portal to big, scary personal leadership. It asked us: What does it mean to own yourself; how do you practice this freedom you, and your people before you, have demanded and earned? Less things, more life; trust my children; get to understand how learning happens; get involved in life, not the preparation for it at some future dates. 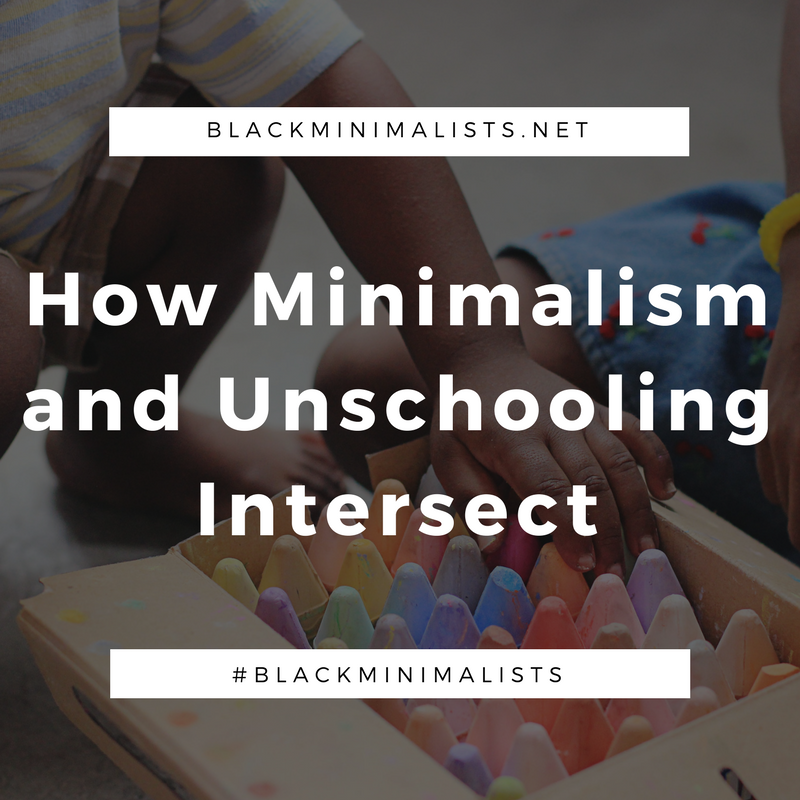 That is the link between unschooling and minimalism for me. The more I shed, the more space I have to see what matters, and what’s valuable. In our years raising now 13 and 11 year old girls, I have learned the value of seeing them as sovereign people with whom Kris and I partner to grow together, the four of us, and to safely explore and express ourselves. Our girls are not extensions of us; they own themselves. And in that light, I don’t own anything but myself, and I don’t want anything to serve as unnecessary weight that attaches me to things that don’t feel anything like freedom." Read the rest of the original article. Author, entrepreneur, writer, umi. Speaks on radical self-expression, Black womanhood, intersectional feminism, digital nomads & unschooling. Learn more about Akilah and her work at Radical Selfie.